If I've said it once this last week, I've said it a million times. I. am. ready. for. spring. Seriously though, we had a couple of days in the 60s, and when the sun was shining, it felt even warmer than that. I know spring will come soon enough (and I don't need to get my hopes up because we still have a few more solid weeks of winter - if not months), but I have vacation fever on the brain. I have been pretty good about not doing too much shopping lately, but I don't know if I can stay steadfast in that with all of the pretty things that are being released in anticipation of warmer weather. 1. 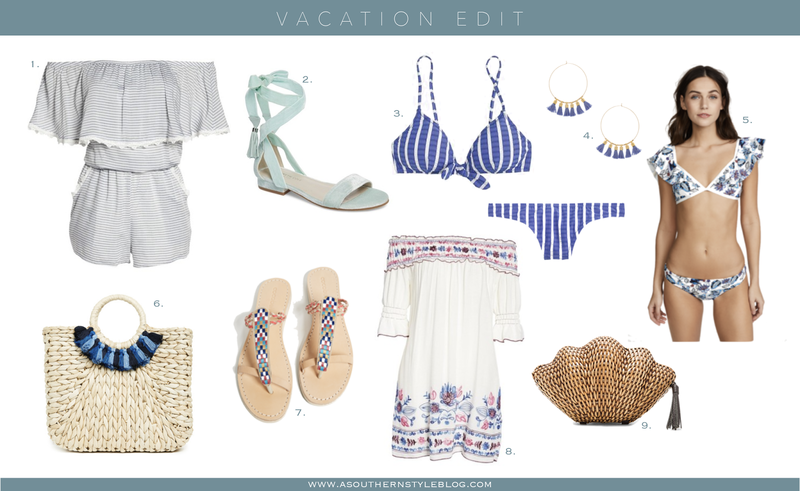 Nantucket Romper - I love a good romper, but especially for heading to the beach. It makes throwing on a coverup super easy. 2. Tassel Sandals - How adorable are these? Love the color. 3. Striped Bikini - I love anything striped and blue is clearly on my radar these days, so I'm loving this adorable top & bottom set. 4. Tassel Earrings - The perfect vacation accessory. 5. Floral Bikini - Seriously, this is the cutest thing ever. 6. Straw Tote - this tote is perfect for when you just need a bag big enough for a book, your phone, and sunscreen. 7. Geo Sandals - I live in sandals during the summer, so sign me up for these cuties. 8. Off Shoulder Dress - Another adorable cover-up option. Loving the floral embroidery.